Due to the natural and environmental conditions, the Austrian electricity sector is largely based on renewable energy sources. Nevertheless, there is still enormous development potential, especially in the field of hydropower. However, the use of hydropower is associated with a conflict of interest. Although investments in hydropower are undisputed due to security of supply issues, climate change and dependency concerns, the technology raises an issue of social acceptance. Hydropower plants are often seen as a blot on the landscape and a threat for the ecosystem. These positive and negative effects can be seen as externalities that need to be taken into account when investing in new hydropower facilities. This work therefore refers to the monetary valuation of the multiple impacts associated with future hydropower investments. 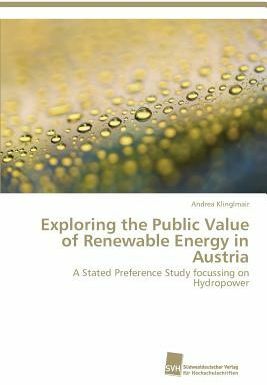 By means of "Stated Preference" methods, a comprehensive online-survey of Austrian citizens and the statistical evaluations based on the collected data, the trade-off between economic and climate-related advantages and the negative environmental side effects new hydropower plants are associated with was identified and quantified.